If you’re going dairy-free, one of the first things you know is off the table is cow’s milk. If you never were a big milk fan, this probably isn’t too difficult for you to adopt. However, if you love to drink milk, use it in a lot of cooking, or eat cereal regularly, giving up milk can become a pretty big challenge. Even if you have to give up cow’s milk (or any other dairy milk), there are milk options for you! 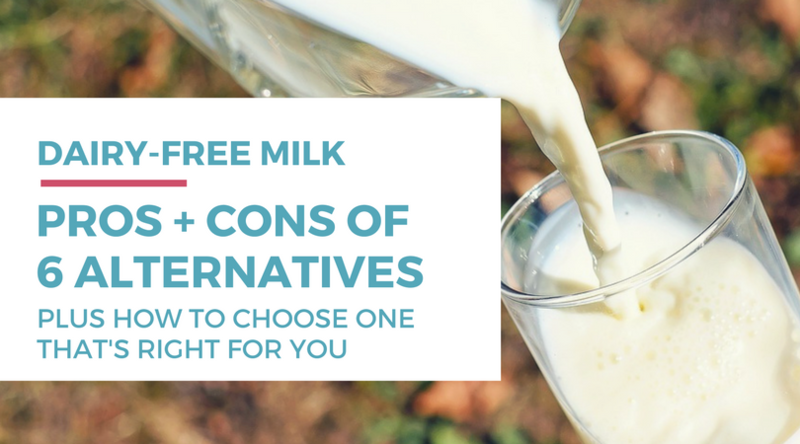 They all have their own pros and cons nutritionally, and I’ll do my best to outline some of the most popular dairy-free alternatives here in this blog. By the end of this post, you’ll hopefully be setup to try a few new plant-based milks that are not only good for you, but taste good and are a wonderful addition to your dairy-free cooking. Before I get into the specifics of the dairy-free alternatives that are available to you, let’s first talk about milk in general. One thing that many women worry about when going dairy-free is where their calcium will come from if they cant enjoy milk, cheese, or yogurt anymore. And while I totally love the enthusiasm to keep your calcium levels high and your body healthy, we don’t actually NEED cows milk products to get our calcium needs every day. There are loads of other high-calcium foods that we can eat in order to get our daily requirements like broccoli, Brussels sprouts, and kale. Eat more greens and don’t worry so much about getting that calcium. You might also worry about getting enough protein if you give up drinking milk regularly. Of course, this is something to consider – but you can also get adequate protein from other sources. Meat, the most obvious source, is a great way to get your protein. But other foods like eggs, almonds, oats, peas, quinoa, and even broccoli provide protein. Check out this great list of high-protein dairy-free foods as well. This is another great resource on vegan protein sources as well. Now, onto the topic of dairy-free milk alternatives. One thing to take note of is that all of these “milks” don’t really come from nature. We’re creating them in our kitchens or companies are manufacturing them. That means that in order to keep them shelf stable (and even tasting decent sometimes), you’ll find a lot of extra sugar, preservatives, and artificial ingredients thrown into the mix. When you’re choosing a dairy-free milk alternative for yourself and your family from the grocery store, look for the ones with the least amount of ingredients, thickeners, sugars, preservatives, and artificial ingredients included. This is where knowing how to read ingredient lists is super important! The healthiest option will always be the unsweetened and plain varieties. With all that out of the way, let’s go into details of what the most popular dairy-free milk options are – and some of the pros and cons of each. Pros: Naturally sweet, nutty and very palatable compared to other dairy-free milks. Great source of calcium, potassium, manganese, magnesium, vitamin E, copper and selenium. It’s naturally low in saturated fat and has no cholesterol. Cons: Doesn’t hold up well to heat during cooking – the flavor shifts substantially in my opinion. Manufacturers tend to additionally fortify this milk with vitamin D and calcium to make it match cow’s milk – even though the body doesn’t readily absorb these nutrients than when it occurs naturally. Pros: Neutral coconut taste that can used in sweet or savory dishes, and palatable on its own. Good source of saturated fats and antioxidants. Coconut milk is said to contain antiviral, antibacterial, and antifungal elements to boost your immune system. Cons: Often contains additional gums, thickeners, binders, and additives like guar gum, xanthan gum, and carrageenan. Canned coconut milk is often lined with BPA. Pros: Good source of protein, calcium, phosphorus and magnesium. High in Omega 3 and 6 essential fatty acids, low cholesterol, and a similar texture to cow’s milk. Cons: The flavor is very “grassy” and isn’t very neutral tasting in many dishes. More expensive and harder to find. Pros: A tasty alternative that is great on its own or in cooked dishes. Good source of B vitamins and antioxidants. No saturated fat or cholesterol. Cons: Not a good source of calcium or protein. Since it is so starchy, it is high in carbohydrates and therefore not great for diabetics or those watching their blood sugar. Rice contains arsenic and many are concerned that drinking too much will bring about health effects. Pros: Good source of protein, no cholesterol or saturated fat. Is a popular dairy-free option and therefore readily available in many grocery stores and restaurants. Palatable and neutral flavor. Cons: Concern over presence of phytoestrogen in excess that can cause an estrogen overload in the body. Is especially of concern to those who deal with any sort of thyroid issues, allergies, and reproductive issues. Pros: Sweet, creamy flavor that is quite palatable and a neutral flavor. Great source of calcium and healthy fats. Low in saturated fat. Cons: Not as easy to find in grocery stores (yet!). The Safeway near my house carries a wide range of dairy free milk alternatives. Some are in the dairy section like soy, almond, soy and almond creamer (Silk, Califia). Some are in the baking section like almond, rice milk. There is also flax milk too that I have tried in baking. That’s great, Veronica! There definitely are more types of dairy-free milk than the ones I listed here. I’m glad that you have access to a wide variety of options in your area.